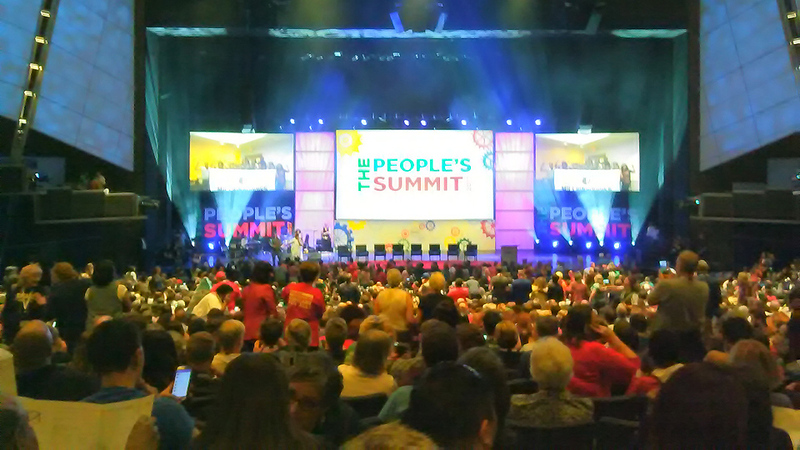 Thousands of activists emboldened by Bernie Sanders’ calls for a political revolution against the billionaire class attended this year’s People’s Summit in Chicago on June 9-11, one year after the inaugural event which convened in the last weeks of the 2016 Democratic Primary. Again, major unions like National Nurses United (NNU) sponsored the event along with People for Bernie and Democratic Socialists of America. Taking place this time with a dangerous right wing president in the White House, what nonetheless stood out among the crowd of 4,000 people was the huge enthusiasm and confidence present. Just days before, Jeremy Corbyn had stuck a huge blow against the Conservative Party in the UK by running on a bold left program and making a historic gain in seats for the Labour Party. The parallels between Sanders and Corbyn fed a discussion at the event about the growing opening for left wing ideas and hunger for an alternative to the politics of big business and the elites. The summit also took place against the backdrop of deepening divisions in the Democratic Party, on display in the Democratic Party “unity tour” in which new DNC chair Tom Perez was repeatedly booed, and again in the recent, highly polarized California State convention with Berniecrats mounting a powerful challenge to the corporate Democrats who dominate the party apparatus. Bernie Sanders, Nina Turner, and NNU’s RoseAnn DeMoro headlined crowded sessions at the summit focused on the need to fight against Trump, take back the Democratic Party, and run progressive candidates to oust the Republicans. As a current candidate for office myself, I spoke with many participants eager to hear about my campaign for Minneapolis City Council. I was inspired to run because I think Minneapolis needs a political revolution. The Twin Cities are home to 17 Fortune 500 corporations, the highest concentration per capita in the country, yet racial and economic inequality are rampant. Rents have increased 15% since 2009, and a recent study found that there is not a single Minneapolis neighborhood where housing is affordable for a median-income black family. I am running as an independent, Socialist Alternative candidate, basing my campaign on the needs of working class and oppressed communities, and fighting for a $15 minimum wage and rent control. I think it would be a mistake to limit my campaign to what’s acceptable to the Democratic Party establishment that has long run Minneapolis and which is responsible for the rampant inequality and affordable housing crisis in our city. I accept no contributions from big developers or corporations, and pledge to accept only the average wage of a worker, donating the rest of my City Council salary to social movements. The fact that my socialist campaign has already been endorsed by unions like the Minnesota Nurses Association and the Communications Workers of America MN State Council shows it’s possible to win broad support for independent left politics. While the many sessions at the People’s Summit explored a range of topics, the biggest shortcoming was the lack of real debate about strategies and tactics for social movements, for how to defeat the right, and for building a real alternative to corporate politics. Too often the main solution put forward was to run more Democratic candidates. It was unfortunate that the summit organizers chose not to invite Socialist Alternative member and Seattle City Councilwoman Kshama Sawant to speak at the event. Kshama could have brought into the discussion the experiences of Seattle and the strategies and tactics used there to win a series of progressive victories. It’s no coincidence that the first city to elect an independent socialist in decades was also the first major city to pass a $15 minimum wage. Kshama has also taken on the powerful real estate developers who typically shape Seattle politics to win a series of housing victories, led the charge to divest city resources from Wells Fargo in solidarity with Standing Rock, and linked up with “Block the Bunker” activists to defeat attempts to build the most expensive police precinct in the country. Crucial to these successes has been Kshama working with social movements to build an independent political force, spearheaded by Socialist Alternative. I was inspired when RoseAnn DeMoro, the President of the National Nurses United responded to the strong presence of Draft Bernie at the summit by challenging Bernie in a friendly way to build a “People’s Party,” to huge applause. Socialist Alternative recognizes that the main energy on the left at present is toward “DemEnter,” and while we sympathize with the serious struggle underway to “take back” the party from an entrenched corporate leadership, we think it is extremely unlikely to succeed. The support at the summit for Draft Bernie’s call shows there is also a recognition among many Berniecrats of the major obstacles to their struggle with the corporate Democrats, as well as openness to the call for a new party. Working people and youth are rising up in a way that has not been seen in decades, and there is a growing interest in socialist ideas. The People’s Summit, as well as the massive protests already this year against Trump, show the foundations exist to develop powerful new movements and organizations. Now is the time to rebuild the left and the socialist movement, to run our own independent candidates with bold anti-corporate, pro-worker campaigns, and to lay the groundwork for a new mass party for working people.